Familiar Strangers: The Church and the Vegetarian Movement in Britain 1809-2009 by John M. Gilheany, published by Lulu. Lulu, the online self-publishing Web site, is phenomenal. My introduction to Lulu was when I wanted to produce privately a book of the chapters I had been writing for my forthcoming book, Animal Dharma. There was a bit of a learning curve in figuring how best to format the text but after some experimentation and making mistakes, well, it was really quite easy. Then, within a day or so, your book is delivered to your home in days! On Thursday, January 27 I placed an order for a book. On Saturday, January 29 it was delivered in the mail to my home. That’s amazing! The cost? As much as I would be prepared to pay for it in a bookshop. 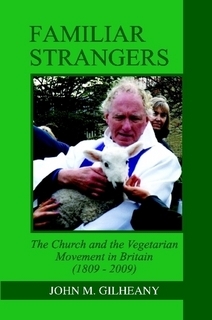 Familiar Strangers: The Church and the Vegetarian Movement in Britain 1809-2009 by John M. Gilheany, which I look forward to reading, as I love studying the history of the UK and US animal welfare/rights movement. Thanks for your choice of purchase there, Kim! I’m sure you’ll find my book to be a useful resource in the future and readable enough in the short term. (I’m equally sure that you’ll afford a perfectly honest take on the title in any event). Lulu is certainly an efficient service for amateur authors with but one notable niggle: the garish colour scheme that afflicts certain covers in their on-line catalogue! Apart from that, Lulu products are slick and sturdy which would explain the huge popularity of their print-on-demand operation.